I was taking pictures of the students from my school doing exercises on a sandy bottom in Marsa Shagra bay, when I saw this stingray coming towards us in the corner of my eye. I lay on the sand, trying to breathe very little and let the animal approach. It came quite close and then turned when it had reached its comfort zone. It is when I took the picture. 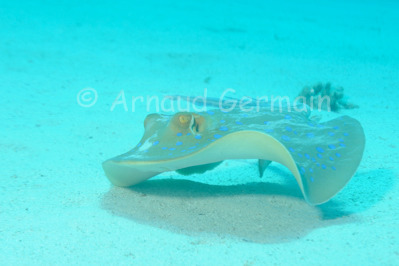 You can clearly see the two barbs on the tail of the ray. Nikon D700, Nikon 28-105 mm macro at 90mm, F9, 1/250th, ISO 400, Ikelite Housing and Ikelite DS160 strobe set on TTL. Marsa Shagra Bay, about 7 metres down, Marsa Alam, Egypt.